This blog is to share my thoughts on the angling scene in Malaysia, it's good times and the short comings, policies and environmental concerns as I believe our fisheries is our heritage and must be protected for future generations. The Peacock bass in Malaysia has been documented as highly destructive to the local eco-system. How so? Well, Peacock Bass is a ferocious alien predator that would decimate any other fish species in the waters. As fingerlings, they hunt in packs devouring all other species like the local seluangs, shrimps, tiger barbs, haruans, tomans, etc. Being cichlids, they breed prolifically to ensure survival of the species. Their population would ensure total colonisation of the pond. You might argue that there are already Tomans and Haruans in your pond but consider this scenario. The PB's devour all the Toman and Haruan fries in the pond. The aging mama Tomans and Haruans fry production slows down due to age and eventually dies. All the while, the PB's are breeding like rabbits and feeding on other species. In the end, you'll end up with a pond of Peacock bass only. Not even guppies aka "longkang fish" would survive. This is exactly how most of the ponds and lakes in the Kinta valley became what it is today. 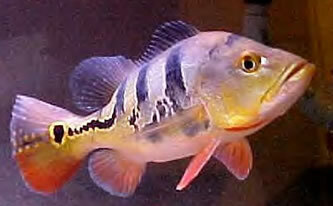 It is with the introduction of the Peacock Bass and other imported alien species like the Flower Horn, Red Emperor, Tiger cichlid, Jaguar cichlids, etc. ; either by "fish dumping" by pet owners bored of their pets or some anglers introducing it to the lakes in the name of good sports fishing! You can also argue that pond is isolated and the Pb's stays where it is or that PB's do not breed in fast moving waters. Well, we have seen too many cases of ponds being inundated during thunderstorms or flash floods. They overflow and all the fishes are "spread" to other lakes and bodies of water. The only way a pond once colonised could be cleared of such species would be by draining and poisoning. After poisoning, it takes a minimum of 6 months before fish fries can be introduced to the pond again. Even at that, there have been cases of PB fries being found alive after the pond had been restocked. Apparently, these fries have survived the long period of drought when the pond was drained. Another thing you should know regarding the Peacock Bass. There are 4 main species of it and NOT all of them grow to be giants like those you see in fishing videos in the Amazon! There is only one species that grows huge but takes a long time to do so. Most if not all the PB's found in Malaysian pet shops is NOT that species. Those sold in Malaysia as pets do not grow over 3 kgs if ever they survive cannibalism among their own species when there is no food left in the pond. If you are a keen angler and have been actively fishing, you would know that the local species like the Toman, Haruans, Bujuks, Sebaraus, Gahak, Kenderap, Belida all take lures as well as live bait. And they provide a better fight then any Peacock bass! Even anglers from Western countries are amazed by the raw power of the Tomans here! Be a responsible and wise Malaysian angler and prevent the further colonisation of our waters by these invasive alien species. If it is not agaisn't your principles, practice culling of all invasive alien species. Save Our Species from further destruction to allow future generations to enjoy fishing them as we do now! That includes your future generation! Why Fish with Your Kids?